Johnnie Come Lately ($14.95, 292 pp., ISBN: 978-1-60381-215-3), is a work of Women’s Contemporary fiction by Kathleen M. Rodgers. Despite an outwardly happy existence as a wife and mother, Johnnie Kitchen yearns for a way to fulfill her dreams and end her nightmares. Click here to listen to excerpts from Johnnie Come Lately read by Kathleen on Authors’ Corner. Johnnie Come Lately’s cover is one of eight winners in Southern Writers Magazine‘s Cover Contest. Follow the Johnnie Come Lately blog tour in July, 2015. Rodgers is the winner of the 2009 MWSA Silver Medal Award for Fiction and the 2010 William E. Mayer Literary Award. Her first novel, The Final Salute, was featured in USA Today, The Associated Press, and Military Times. It reached #1 on Amazon’s Top-Rated War Fiction list and was a Book of the Month selection for the Army Wife Network. 5 Stars: “Kathleen M. Rodgers writes a poignant story in Johnnie Come Lately. Powerful! Beautiful! Heartrending! Through the lives of her characters, Rodgers reveals the joys and burdens of motherhood, the trauma of war, and the ongoing battle of an eating disorder…. Rodgers [speaks] directly to the heart of the reader. Warriors fight, they become battle weary, they lay down their lives for others. Some of the greatest warriors are mothers, they battle worry, fear and regret. They sacrifice all they are for their loved ones. Johnnie Come Lately portrays one woman’s will to overcome life’s tribulations through the power of love and the security of hope.” Read more…. 5 Stars: “Ms. Rodgers ability to lend heart and soul to each character is a rare gift and I closed the book with not just tears in my eyes, but with the feeling I had just witnessed the most intimate parts of a stranger’s life, rendering them no longer a stranger. I closed the pages with sadness for the small tragedies that can define our human condition, yet with hope for the transforming power of forgiveness. This is a remarkable piece of writing.” Read more…. “The plot, with its unraveling familial mysteries, makes the book easy to read. The writing is clear and detailed without being floral. The suburban Texan town is written in such detail that the setting becomes an integral character itself…. I recommend this to anyone, but I especially recommend this to women. Because the book revolves so much around character of Johnnie, I think the people most likely to empathize with her will get the most from it. It would be a good pick for women’s book clubs and church book clubs as well.” Read more…. “Johnnie Come Lately takes the reader on a passionate rollercoaster of redemption through brute honesty. The telling is full of raw emotion which touches the reader through myriad sensations. I found myself crying, amused, animated, and angered… and full of anticipation. I look forward to reading Kathleen M. Rodger’s next book.” Read more…. “Kathleen M Rodgers book is truly an inspiration to anyone who has gone through an eating disorder …. Johnnie Come Lately is a great book. It’s a little hard to read this and not feel for the characters.” Read more…. “An unforgettable book…. Rodgers unrolls this story in style, perfectly segueing one thread to the next in a fashion that keeps you turning the pages until a very satisfying end that ties it all back together and answers the questions that teased you throughout the book. Want great storytelling? Read this book.” Read more…. “By the end of the novel, Johnnie Kitchen had become my friend, one that I am sad to be without now that Johnnie Come Lately is off my nightstand and back on my shelf, every word devoured.” Read more …. Click here to read an article on Johnnie in Stars and Stripes. “With the grace of a consummate storyteller, [Rodgers] saves the hardest truths for last…. [She] has made a place for Johnnie in the hearts of her readers.” Read more …. “I understood Johnnie’s feelings, as a daughter, wife, and mother. In fact, the author relates to all women. That’s the beauty of the story. Johnnie is real.” Read more…. “If you enjoy mystery and strength, with a touch of empathy and humor you will find this a great read. Often life’s road is not what we expect , but it takes a great deal of energy and fortitude to move forward in some cases and Rodgers takes us there with this work.” Read more…. 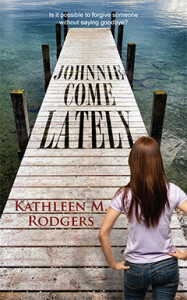 “Kathleen M. Rodgers captures several life-changing events in Johnnie Come Lately with empathy, seriousness, and humor. Her characters are well-defined; her plot is very credible and her use of schemes to further her story all combine to make this a completely entertaining read.” Read more …. “The story pulled me in and wouldn’t let me go till I finished it, and I didn’t want it to end.” Read more…. “This is a book that really pulls at your heartstrings. Johnnie is an adult that was raised by her grandparents. Her mom was in and out of her life as a small child. Once she married, her mom was gone for over 20 yrs…. I really felt bad for Johnnie. She has a lot of things to deal with from her past and they always work their way into your present and future if you don’t deal with them. I really enjoyed this book and can’t wait to read the next one in the series.” Read more…. 5 Stars: “In Johnnie Come Lately, author Kathleen M. Rodgers gives an intimate, no-holds-barred account of what it’s like to be inside the average woman’s head…. Needless to say, Johnnie’s mind is a crazy, hectic place. It’s a humming, buzzing cauldron of differing levels of anxiety, yet the book is written in such a way that the reader can feel all the conflicting emotions she’s going through at any given moment. And Johnnie’s not just pondering things that advance the plot, her state of consciousness goes much deeper than that, examining what really makes a woman in suburban America tick in the twenty-first century. How does she fulfill all of the roles that are assigned to her? Mother, wife, daughter, lover, friend, neighbor…even devoted dog owner.” Read more…. “I enjoyed getting to know Johnnie, even in her darkest hours, and found her character very human…. Recommended read for Women’s Fiction fans.” Read more…. Would life have been different for Johnnie if she’d been named after a woman rather than her dead uncle? Or if her mama hadn’t been quite so beautiful or flighty? The grandparents who raised her were loving, but they didn’t understand the turmoil roiling within her. And they had so many, many secrets. Why did her mama leave? Would she ever return? How did her Uncle Johnny really die? Who was her father? Now Johnnie Kitchen is a 43-year-old woman with three beautiful children, two of them grown. She has a handsome, hardworking husband who adores her, and they live in the historic North Texas town of Portion in a charming bungalow. But she never finished college and her only creative outlet is a journal of letters addressed to both the living and the dead. Although she has conquered the bulimia that almost killed her, Johnnie can never let down her guard, lest the old demons return. Or perhaps they never went away to begin with. For Johnnie has secrets of her own, and her worst fear is that the life she’s always wanted—the one where she gets to pursue her own dreams—will never begin. Not until her ghosts reveal themselves. Kathleen M. Rodgers’ stories and essays have appeared in numerous magazines and anthologies. Johnnie Come Lately is her second novel. She lives in a suburb of North Texas with her husband, a retired fighter pilot/commercial airline pilot, and their dog, Denton. For more information, click here. The Lincoln Continental with a buttercream paint job sailed up to the curb at promptly seven p.m. Granny Opal blasted her horn and Johnnie sprang down the front steps to greet her. “You look a little thin,” Granny called out. She was wearing that loopy grin that seemed to grow more lopsided every year. She wore purple gauchos, a short denim jacket—to conceal her expanding waistline—and her trademark red cowboy boots. Big silver hoops looped through sagging earlobes dangled below her cropped hair. Early in her recovery, when she avoided sweets for fear they would trigger a binge, she refrained from saying anything derogatory every time her grandmother appeared armed with a dessert. Then one year, the year Johnnie was pregnant with Cade, she thought Granny Opal finally understood. After a meal of baked chicken and tossed salad, Johnnie’s grandmother sailed into the dining room with a large head of cabbage on a crystal cake pedestal. Planted in the middle of the cabbage was a fat pink dinner candle. After everyone stopped laughing long enough to sing “Happy Birthday,” Johnnie blew it out. When Johnnie quietly sighed with relief and started to open her presents, Granny Opal appeared in the doorway with a Texas sheet cake, much to the delight of a young D.J. and Dale. Granny Opal linked one arm through Johnnie’s and together they mounted the steps onto the large porch. “Everything looks lovely,” her grandmother commented as they entered the house. Cade and Callie Ann were out back, playing fetch with Brother Dog. As Johnnie went to place the cake on the long farmhouse table that served as a room divider between the kitchen and the family room, she saw Granny Opal poke her head out the back door. Johnnie looked up, wondering how Cade would respond, but her grandmother had already stepped outside onto the deck and shut the door. A few minutes later, while Johnnie set out dessert plates and forks, the back door opened, and Granny Opal filed in, followed by Brother Dog. He trotted straight to the laundry room, where Johnnie could hear him lapping from his water bowl. Granny Opal went to the sink and helped herself to a glass of tap water. “Cade told me what happened.” She turned to look at Johnnie, who froze, afraid to look into her grandmother’s dancing eyes. How much had Cade told her? A knot in her stomach, Johnnie watched herself pull out a chair and sit down across from her grandmother. The heady scent of birthday cake and vanilla candles filled the room. She felt a headache coming on.